NOLA’s signature sandwich—the po’ boy—is a full-on meal jammed into an overly generous length of “French” bread. All the better for soaking up a boozy bath of the city’s excellent cocktails (and less excellent, but oh-so-fun frozen daiquiris), New Orleans po’ boys bulge with, variously, fresh Gulf seafood that’s fried to a crisp, gravy-soaked cold cuts, and all the trimmings—including lettuce, tomatoes, pickles and mayo. Here, we present some of the Big Easy’s most craveable options, from the new-fangled to the down-home, and even a few non-po’ boy sandwiches—yes, they do exist here. There’s simply nothing more New Orleans than a po’ boy stuffed with sweet, local, fresh-caught Gulf shrimp. Open, on and off, since 1911 and serving its famed shrimp po’ boy since 1929, this Mid-City institution has had ample opportunity to perfect its towering, seafood-spilling masterpiece. Served on crisp-crusted NOLA-style French bread, Parkway’s meant-for-sharing po’ boy tumbles with expertly fried crustaceans and is ideally accompanied by a chilly bottle of French Quarter–founded Barq’s root beer. Po’ boy fillings vary endlessly, but most locals would list just five traditional options: fried oyster, fried shrimp, fried catfish, hot sausage and roast beef. Opened in 1984, Katie’s swerves away from the orthodox and toward the delicious with its cochon de lait po’boy layered with juicy slices of house-roasted suckling pig. De rigeur shredded lettuce, sliced tomatoes and pickles, and a schmear of mayo bring Katie’s po’boy back into the realm of the customary, but the sandwich remains one to order when you’re feeling a little irreverent. 3. Fried Oyster Po’ Boy, Bevi Seafood Co.
With Louisiana producing around a third of the country’s oysters each year, there’s no shortage of New Orleans joints serving up pristine raw oysters. But when you’re in the mood for a fryer-bathed batch, there’s no better destination than Bevi Seafood Co. A market that sources the best Gulf-raised seafood, Bevi’s kitchen certainly knows its way around an oyster, serving them, dressed traditionally, tucked inside a fluffy French bread. If you’re feeling saucy, grab a side of Bevi’s “debris” fries, a poutine-take on spuds that’s strewn with roast beef ends and their gravy. A classic dive bar located in NOLA’s Irish Channel neighborhood, Parasol’s—established in 1952—doesn’t look like much from the outside or the inside (think: green-and-white-checkered plastic tablecloths, a paneled drop ceiling). But locals and regulars know that this is the spot not just for an affordable draft or a down-and-dirty vodka and soda, but also for surprisingly exceptional po’ boys that are prepared with care. The soft shell crab special is the way to go here: a massive, cornmeal-crusted specimen served on toasted, garlic butter–swiped French bread. Though Gulf seafood is an often-irresistible choice when it comes to selecting a po’ boy filling, even fans of fried fish need a terrestrial break once in a while. New Orleans is awash in roast beef po’ boys, those beguiling French dip–esque constructions of toasted bread layered with gravy-soaked slices of beef. The version served up by R&O is the city’s best: the fluffy French bread’s top half dunked in rich drippings that filter down through each stratum of beef, slicking every slice in salty, umami-rich goodness. Sometimes it’s not the question of whether to get some seafood but rather which type to select that plagues the dedicated po’ boy fan. Luckily, in the Big Easy, everything is, well, easy: Here, there’s no such thing as having to choose between plump shrimp and saline oysters. All across town, the half-and-half is a venerable lunchtime option, and laid-back corner bar Domilise’s offers an exceptional one. A large split French loaf makes a cozy bed for a jumble of battered, fried fruits de mer, anointed with tangy cocktail sauce and the standard LTP fixins (that’s lettuce, tomatoes and pickles). Served out of a tiny kitchen at the back of French Quarter mainstay Erin Rose, a memorabilia-bedecked Irish bar beloved for its cream-and-sugar-heavy frozen Irish coffees, creates modern updates to the classic po’ boy sandwich. The winner of the short-and-sweet menu is definitely the “Dark & Stormy,” featuring luxurious slices of rum-and-ginger-glazed pork belly whose velvety richness is offset by a bright, lime-accented cabbage slaw. The garlicky aioli holding the massive sandwich together is the icing on the cake, so to speak. Though they’re certainly the most beloved, po’ boys aren’t the only game in town when it comes to New Orleans sandwiches. Home to a sizable Vietnamese population, the eastern part of the city is dotted with a number of southeast Asian restaurants and bakeries. One of the most venerable is Dong Phuong, a neighborhood fixture for more than 30 years that supplies many NOLA bakeries with (actual) French bread—not po’ boy–style “French” bread—that boasts a wonderful light-yet-chewy texture. You really can’t go wrong with any of the bakery’s 17 varieties of banh mi—that irresistible fusion sandwich of baguette layered with European-style cold cuts and Vietnamese pickled vegetables—but we’re partial to #1. The classic charcuterie combo of pork roll, headcheese and creamy pâté gets a vibrant boost from shredded pickled daikon and carrots, liberal slices of fresh jalapeño, a crispy wedge of cucumber and plenty of piquant cilantro. 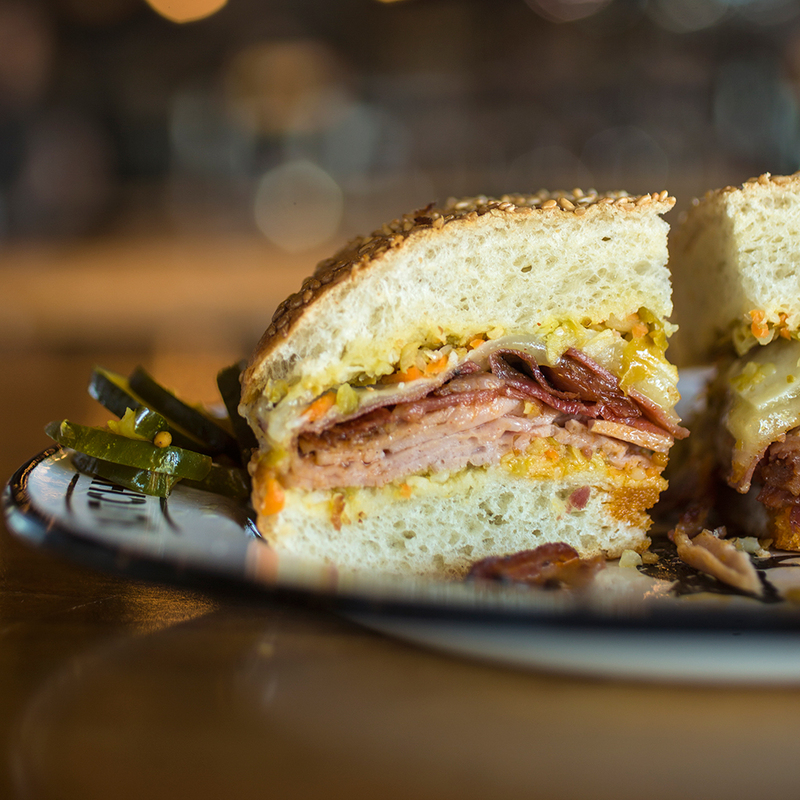 All respect is due to the original creators of this infamous sandwich at Central Grocery, but we have to acknowledge the muffaletta at Cochon Butcher. An individually portioned—but still sizable—take on New Orleans’ classic marinated sandwich of cult cuts and pickled vegetables layered into a huge, scooped-out round of Sicilian sesame bread, the sandwich’s house-cured cold cuts make all the difference here. Superior slices of salami, capicola and mortadella join creamy provolone, pickled peppers and bright chopped olive salad to make a rainbow-striated lunchtime number that’s as satisfying to look at as it is to eat. This 24/7 corner store and deli reopened in 2010 in the French Quarter after a massive fire destroyed the original post. Run by the 77-year-old Shelba Hatfield, massive sandwiches and home-cooking specialties like lasagna and mac and cheese are always available to hungry crowds. The most popular sandwich on the menu is the All That Jazz Po’ Boy: a combination of sautéed shrimp, turkey, ham, mushrooms, two cheeses and a spicy tartar sauce—appropriately named Wow Sauce—all on a footlong French sub. It’s gooey, it’s cheesy, and it’s been on the menu since the place opened up in the ’60s.